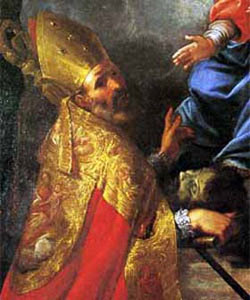 Saint Gratus of Aosta was a priest, bishop of Aosta, Italy at some time after 451. He evangelized his people, established charities, and was known as a miracle worker. He is patron of Aosta, Italy, vineyards, invoked against the fear of insects, against dangerous animals, against fire, and against storms.